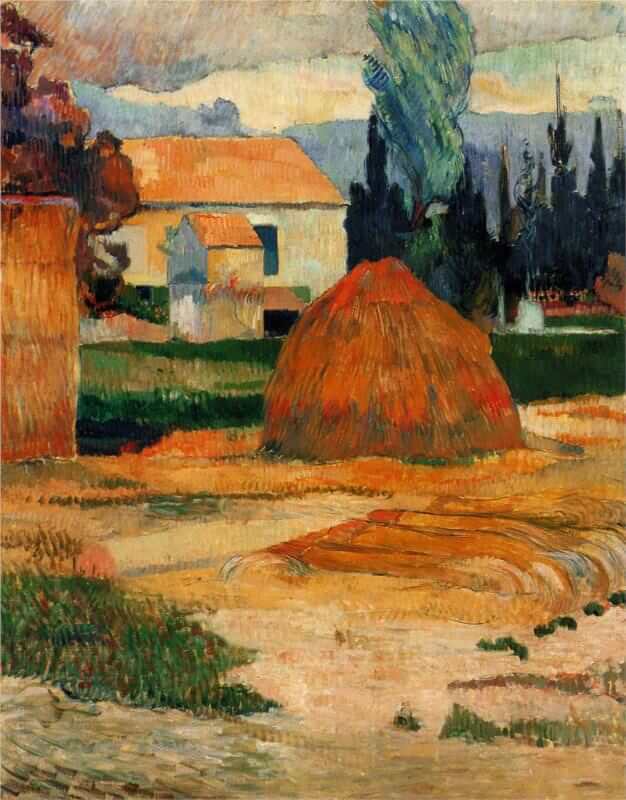 Gauguin's two-month stay in Arles which ended on Christmas Day, 1888, was emotionally surcharged. Despite this, and the intensity of his relation to Van Gogh, his sojourn in the South affected but little the main course of his painting. While he briefly influenced Vincent's style, Vincent's fervent nature produced its impact upon Gauguin the man rather than upon the manner of his art. When Gauguin did see the Midi through any other eyes than his own, it was more through those of Cezanne than of Van Gogh. Here the cubic structure of horizontals and verticals, the overlapping planes of walls and houses, the colors of the plaster surfaces reflecting their surrounding light, the orange tiled roofs and the blue trees and distant hills all reveal the vision of Cezanne. Only the bold strokes of the foreground with their sense of the movement of the hand in their application, the obvious broken-color technique of the grass and haystack, as well as the higher-keyed more acid hues, suggest that Gauguin was painting side by side with Van Gogh. In all these respects this picture is exceptional and important. It makes us realize that Gauguin, for all his fierce independence of character and style, was an artist who, without copying, understood and absorbed what he needed from the work of the great men around him.